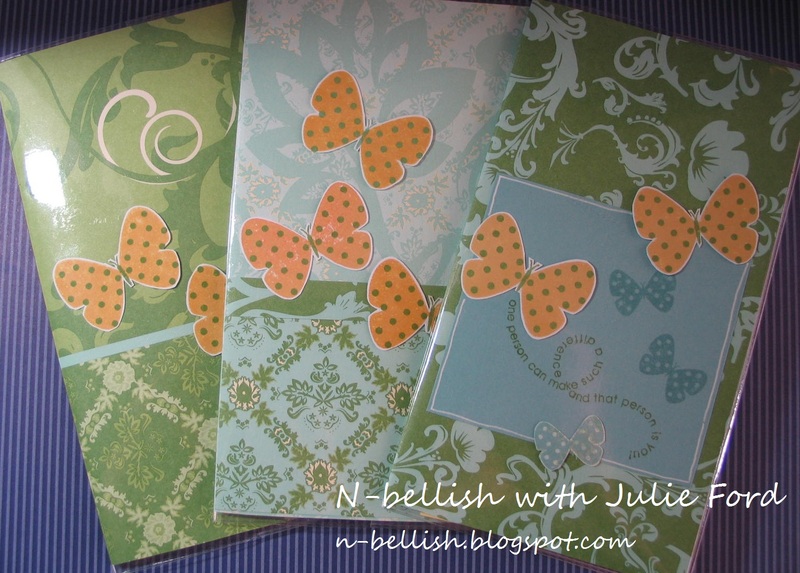 Having made the other diary covers for a challenge this week, I decided to keep going and make these additional ones for the Mum's in my new Mother's Group. More so just to say a big thank you to them for bringing me into their already well established group. I have had so many laughs with them all and have thankfully learnt a lot about different places in Newcastle - all of which I am sure would have remained unknown to me without them. We've had many a playdate with lunches and it's been mostly relaxing! Unfortunately some of the Mum's are moving on as they are posted interstate next year but for the remaining ones we'll keep kicking on each Thursday, with a few added additional little people, as well as hopefully some Mum's that post in. I used some retired SU papers - which for the life of me I can't recall the name of, as well as some of that never ending paper stash. 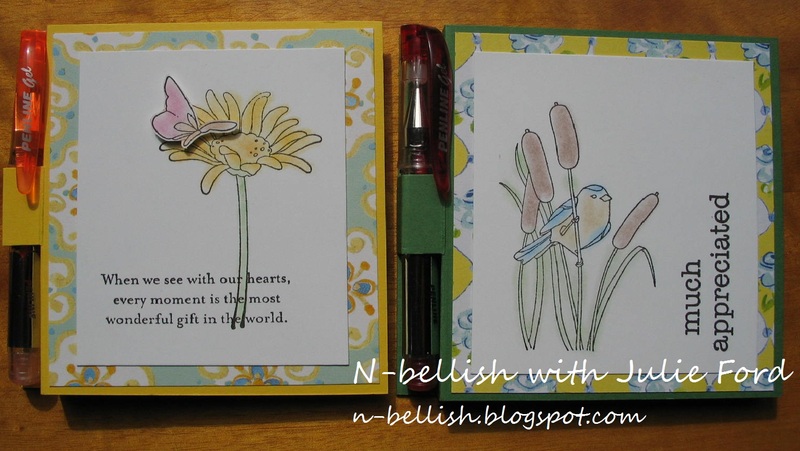 The two stamp sets are the Array of Sunshine (IB&C p8) which is a part of the hostess benefit program and the other is the Flight of the Butterfly set (IB&C p76). Don't forget that the annual Sale-A-Bration begins on the 24th January - which really is just around the corner. This year they've made it a little different including other items than just stamp sets! I'll be able to give you all a sneak peak soon. If you'd like a copy of the Sale-A-Bration catalogue just send me an email. Still on the quest to complete Noah's main teachers Christmas gifts I decided to make them each a covered diary. I didn't want to make large ones as I know that one of the teachers keeps hers in her handbag. Searching through a couple of stores I managed to get some small two year diaries that had the plastic sleeve cover that is removable. 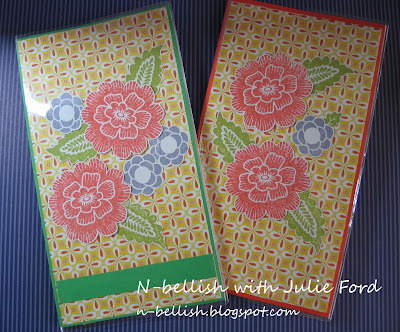 Wanting to use some of the recent In Colour designer papers I made the covers in keeping with this weeks inspirational photo challenge over at Just Add Ink. It is a very bright and happy photo which combines the colours Melon Mambo, Lucky Limeade, Poppy Parade and Pool Party. Here's the photo inspiration. 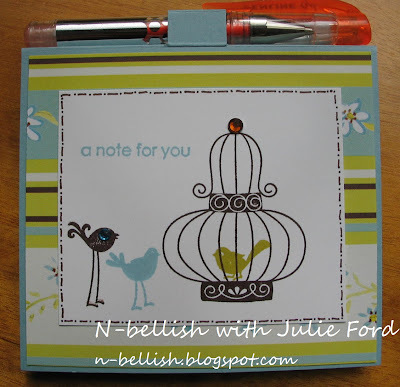 The covers can be made however you like them and it's a fantastic item to do as they are quite quick - once you decide on your design, and allow you to create a unique gift each time. Perfect for children to help out with. 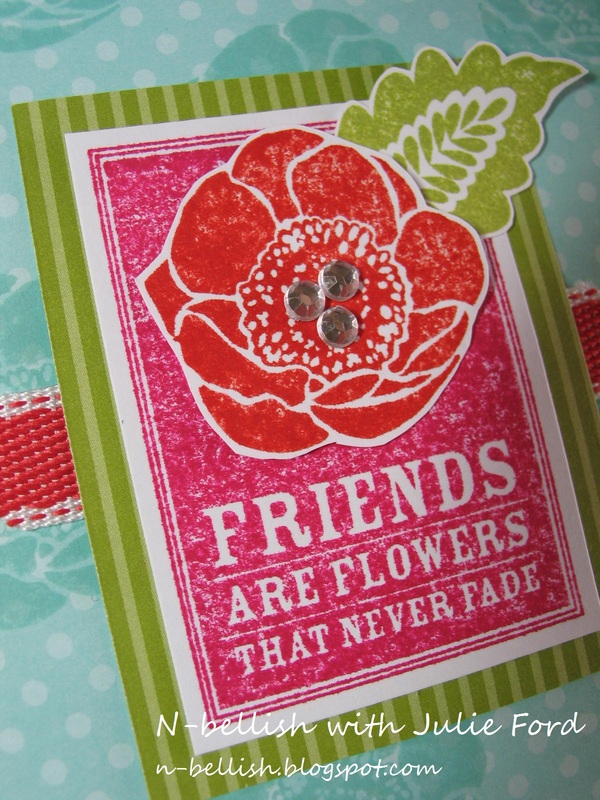 I've used the Friends Never Fade (IB&C p75) clear stamp set which I only just bought as it is a part of the December Frenzy making it 50% less than normal. 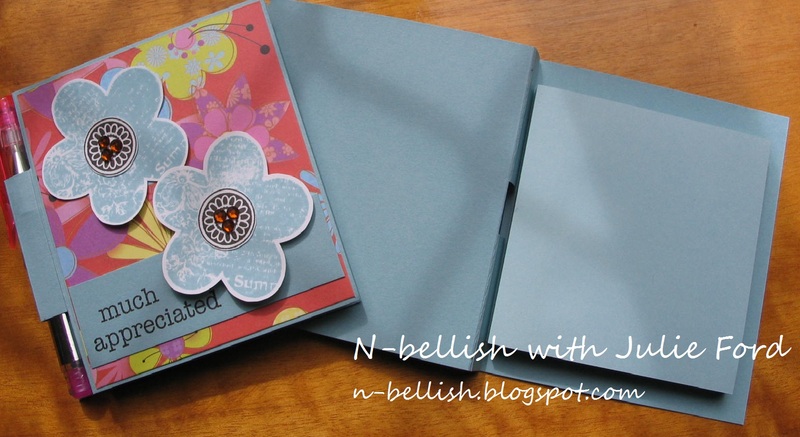 It's a great set as the flower components can be used for any occasion. I started with a half sheet of each of the Pool Party and Lucky Limeade designer series papers which I cut to size and attached using the snail adhesive. 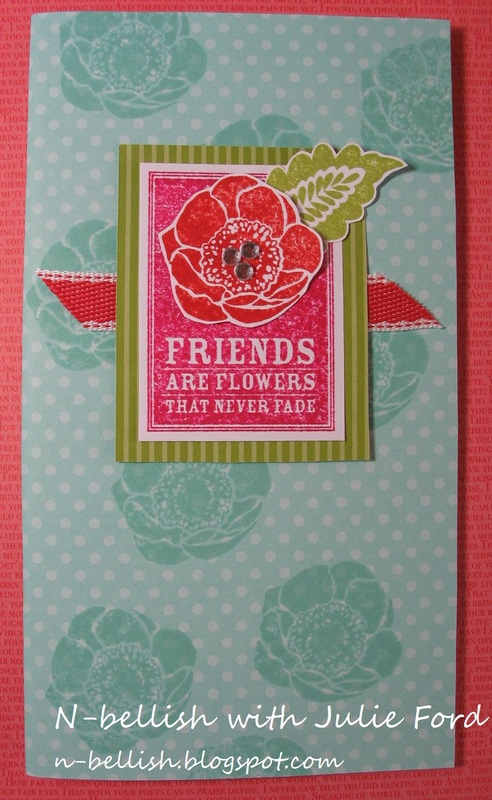 The flowers I stamped in Pool Party, Melon Mambo and Poppy Parade, stamping additional ones so that I could cut out the centres and stick them over the tops to create a more 3D look. I was going to use Dimensionals but when I tried one a popped it back into the plastic sleeve they were just a little bulky so I just used the snail. 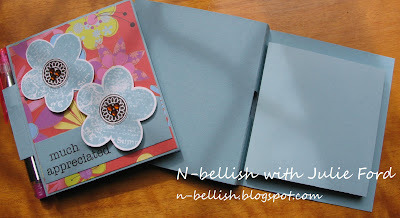 The Pool Party covered diary has the same flower stamped in random places all over the paper in the Pool Party ink for a little more interest. The to complete it I stamped the 'Friends are flower that never fade' sentiment and cut it out before mounting it on a rectangle of the Lucky Limeade dsp. As I hadn't used much of the Poppy Parade colour I added a piece of the stitched ribbon, then the flower in the same colour. 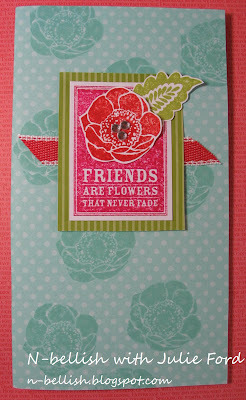 The leaf is from the Array of Sunshine hostess set (IB&C p8) stamped in Lucky Limeade ink. I did add a couple of rhinestones to the centre of one of the flowers which makes it a little bulky but it still works. The Lucky Limeade covered diary took a little longer as I had to cut more centres out of the flowers and add a few little scrap pieces of dsp to add a little more eye interest. I feel as though this one needs something else on it but can't quite work out what yet. Perhaps some chipboard initals or the year? 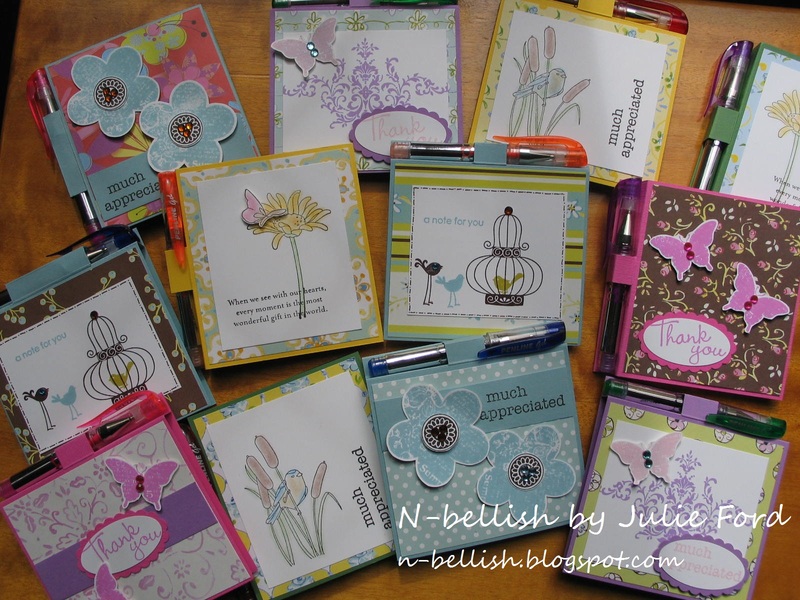 These little diaries took no time at all to make and I'm really happy with how they ended up. Don't forget about the December Frenzy sale which ends soon. The Friends Never Fade set is an amazing 50% off! Be quick though as it ends soon. 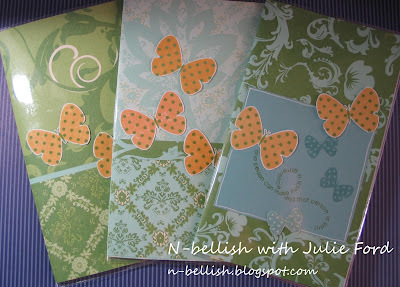 Tools & Embellishments: Paper cutter, snail adhesive, paper snips, clear stamping block, ribbon, rhinestones. Ok so I was a little over enthusiastic when I decided to make these as the party favour thank you gifts for Noah's 5th birthday underwater themed party. I will also say it is very unlikely I'll be crazy enough to make them again. Having said that it's super lucky that I have already cut and scored the additional ones I will need for his January party, as otherwise they wouldn't be happening! I came up with the orginal shape after a number of hours and a lot of wasted paper, which I then transfered to a sheet of thicker cardstock. This became my template. Unfortunately they are a little larger than a 12x12 sheets so I had to get some A3 sized cardstock. I could also have joined two pieces of the 12x12 but found the A3 was easier to work with. Once I traced the template onto each A3 sheet I cut them all out and then scored the required lines. From then it was just a case of folding on each of the score lines, then taping the bottom and side join. I ended up having to go back and use Sticky Strip on all of them as the snail adhesive was just not strong enough to hold the sides together. The red side parts are mainly for reinforcement of the boxes and each of these has the Fish Frenzy (Summer Mini Catalogue) rolled onto it in VersaMark Ink. The lock part was free drawn, cut and stuck on with my snail adhesive. Noah and I finally filled them with lots of themed goodies - bath squeeze toy, chocolate coins, candy bracelets, lollipops, the cutes thong (flip flop) notebooks and some other goodies. Thankfully these are ready for the 'school' party on Sunday. I hope the little people like them and that they at least keep them for a little bit of time! I also made my own party hats out of A4 cardstock which I added a fringe to hoping it looked a little like seaweed, then we added a couple of fish stickers. 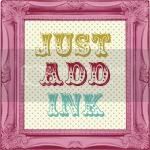 I had hoped to stamp my images and then fussy cut and stick them on but just ran out of time. It's the last week of Preschool for Noah on the base and he asked if he could give the teachers a gift to say thank you for the teaching him this year. We normally do a small gift for his teachers so I didn't think twice about it. When I asked him who he'd like to give a gift to he rattled off four names, five names, six names and by the end of the time we spent talking there were some 14 names. Fourteen - are you kidding. But when I stopped and thought about it many of the ladies at the Centre rotate around for breaks, lunches, programming time etc so all have had some interaction with Noah throughout the year. After a lot of thinking I decided on the Post-It Note Holders that I've been keen to try making for some time now. I managed to grab the Post-It Notes from the $2 shop (though they were somehow a lot more than $2! ); but now that I've used them I would probably recommend spending the additional amount and getting the proper ones that are more tacky, as I did have a few problems with them coming apart at times. Once my DH worked out the measurements in metric terms for me, the making process was very simple and surprisingly fast. The cardstock measurements are 20cm long and 9.5cm wide. You then need to measure in 9.5cm, 10.5cm and 11.5cm, score and fold on each of the lines. Fold it using the centre scored line. Don't be worried here when you notice that the front panel is shorter than the back - it works out in the end! Still on the centre fold cut two shallow slits which the pen will go through. The push this cut out part so it folds outwards while making sure the two side parts fold inwards. You will need to add a little tape - the Sticky Strip is needed here as the normal snail does not work as it's not strong enough - to hold down the two sides. Using more Sticky Strip attach your post-it notes to the base of the holder butting it up to the inside edge as can be seen in the photo below. I found I needed to put a couple of strips to make sure it held firmly. This is where the front panel then evens out and completely covers the notes. 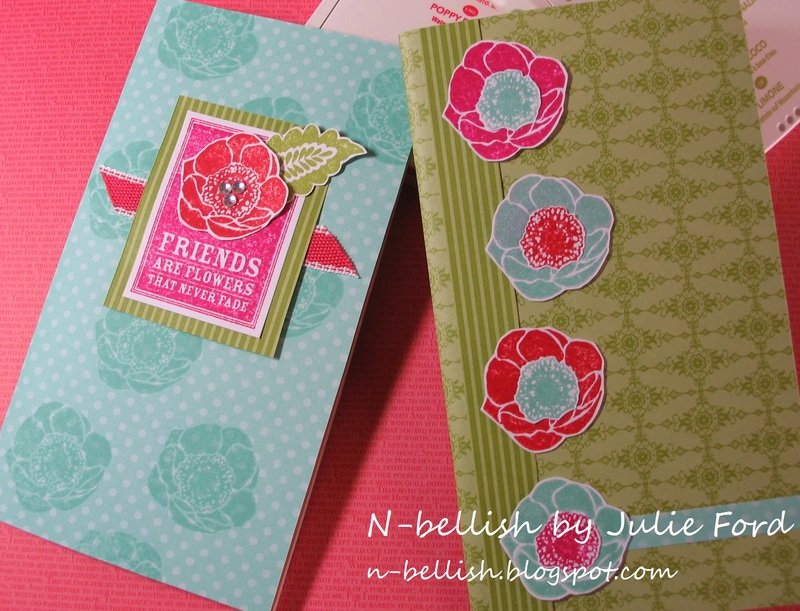 While I used Stampin' Up! 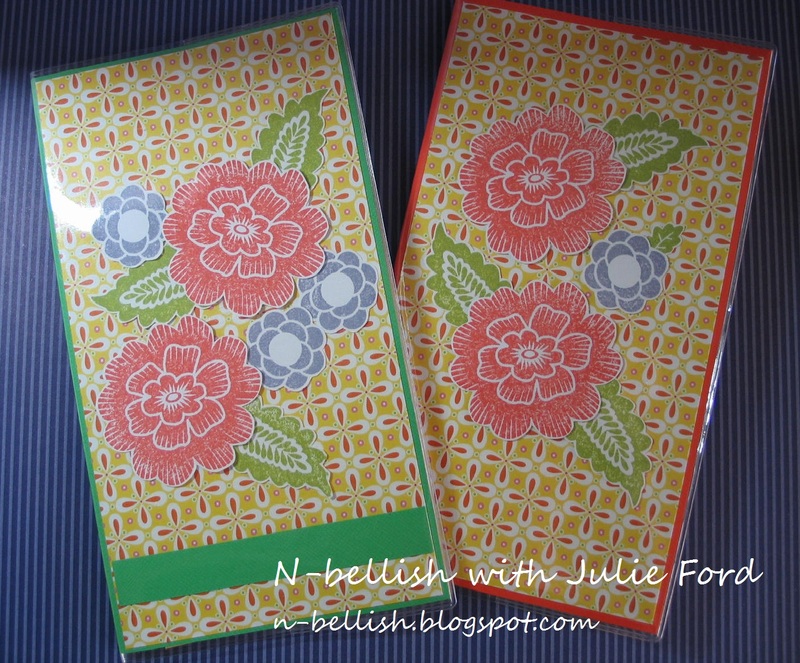 cardstock for each holder to decorate the front panels I choose to use various patterned papers that I had lying around - yes another stash! I tried to match the papers as closely as I could with the post-it notes themselves. The paper measurements were approximately 9cm x 8cm, though if you just measure the front of your closed holder and take off about 5mm it should work nicely. 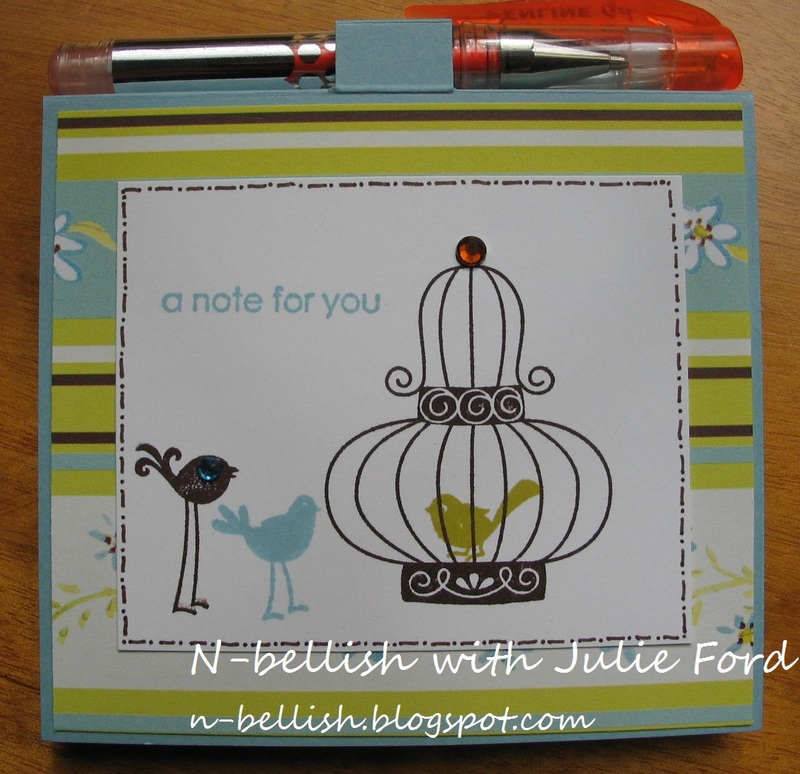 The stamp sets were again all SU - Aviary, Bliss (retired), Posy Petal(hostess), and Every Moment. The sentiments are unfortunately all retired ones but there are so many in the current catalogue that would be suitable. Most were just stamped, but the Every Moment I used the Stampin' Pastels for a completely different effect. The holders that I am happiest with and like the most are definitely the Avairy and Every Moment ones. The Every Moment stamp set is a new one that I only acquired this week as it's a part of the December Frenzy and is a crazy 40% off. To cpmplete the holders I added the mini gel pens which I also managed to pick up for a few dollars at the $2 shop. The colours weren't the best as I would have preferred to have all black or silver but I had to use what I could find. An alternate would be to just use big pens or small pencils if you can find them. Finally I put them into the clear cello bags to ensure they will be in perfect condition when we give them to the teachers and cut a Top Note Die using my Big Shot Machine, stamped a Merry Christmas sentiment from the Contempo Christmas set and attached them using glue dots. So let me know what you think by adding a comment. My little man is turning 5! Summer Splash party invitations. 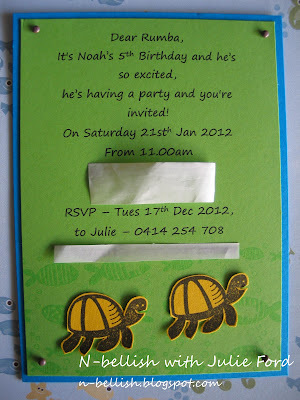 Yes it's happened, we are gearing up to celebrate Noah's 5th birthday. I can not figure out how it came around so quickly but it's here and it's going to be somewhat different being that we're not in Canberra for the celebrations. Being very pregnant I figured if I didn't get these invitations made early I wouldn't get them done so over the last couple of weekend I have been a busy Mummy stamping, cutting and putting together. Thankfully they are all done and all I have to do now is get them into the post. The stamp set and roller wheel are new limted releases and I think they're so wonderful particularly as we now live so close to the beach. 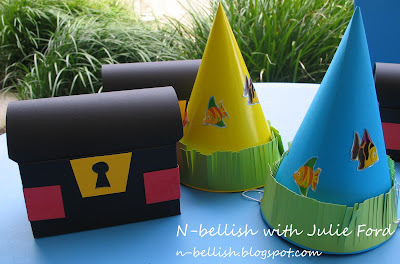 Originally Noah asked for a submarine themed party but due to the restrictions on all things submarine I asked could be do an underwater themed party instead. After a lot of consideration from a 4 year old, approval was given! The set is called Summer Splash and the jumbo wheel is Fish Frenzy, both of which can be found on page 16 in the new Summer Mini Catalogue. 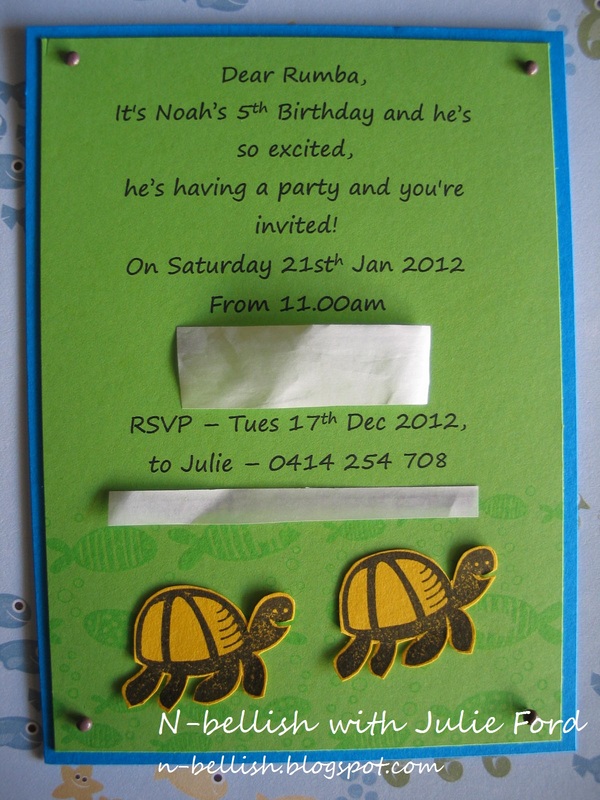 They're flat one sided invitations which I printed the wording straight onto from my home computer. After cutting them to the size I wanted I rolled the Fish Frenzy wheel over the bottoms of each. 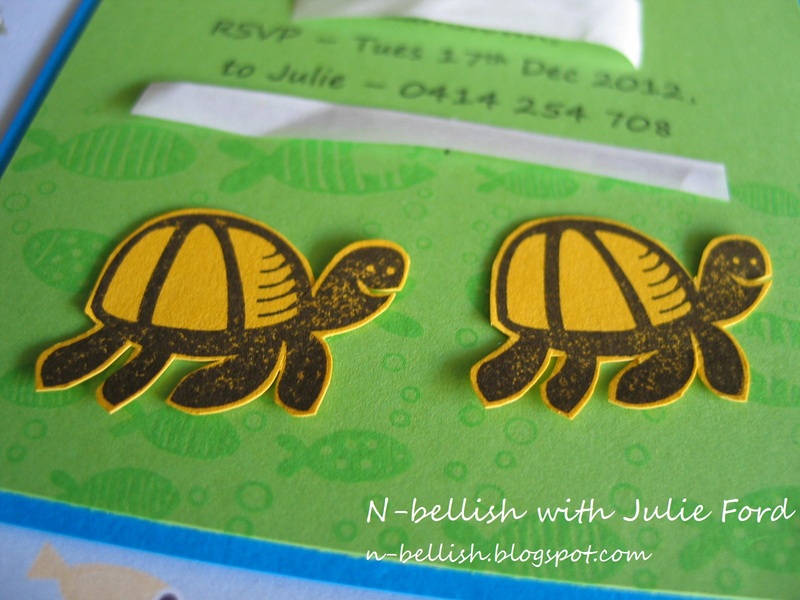 The turtles are stamped in Early Espresso ink onto Daffodil Delight cardstock and I hand cut all 46 turtles out - which did take some time! 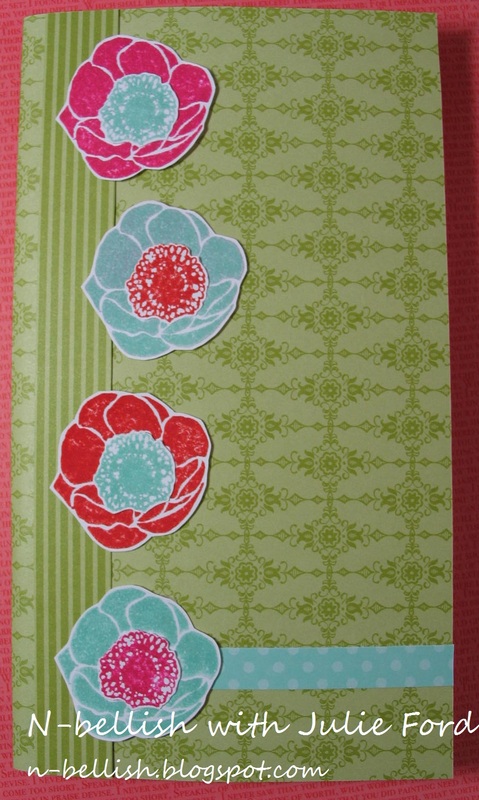 Each green portion is then attached to a piece of Pacific Point cardstock using adhesive and then after poking some holes in the corners with the paper piercing kit I added a couple of brads to ensure it all held together. The turtles were stuck on with dimensionals to raise them off the page a little. Noah's very favourite colour is yellow so the turtles are his favourite part he tells me. The only one thing I am annoyed about is the RSVP date is wrong! It should say January not December - oh well that happens when you're working with the pregnant brain!! 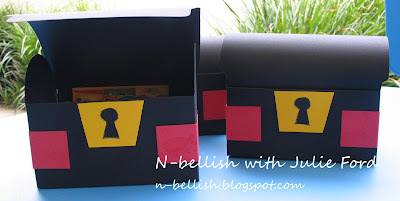 Next to come are the treasure chest party favour boxes I'm in the middle of constructing. 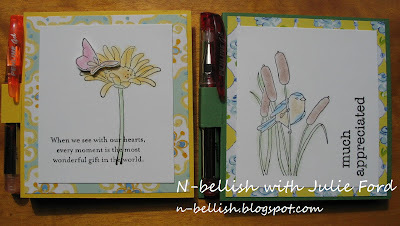 Tools & Embellishments: Paper cutter, snail adhesive, dimensionals, paper snips, brads, jumbo wheel handle. Advent Calendar is finally done! Welcome to Christmas. So I saw this project on line last year and decided I would like to try making one and have been planning on doing it for some months now. But as per what often happens I realised it was the 1st of December and I hadn't actually begun any work on it yet! Thankfully though on Friday Noah had a little friend over to play for a couple of hours and this gave me the time I needed to get most of the calendar completed. The idea for this particular calendar comes from a lady called Beate. They main layout are the same but I changed bits and pieces to suit my likes - especially the papers and numbers. The hardest part of the entire project was sourcing the tins but I did manage to get them from America and I know that they still have many left if you're interested. They are 2" tins or 5cm in metric terms. 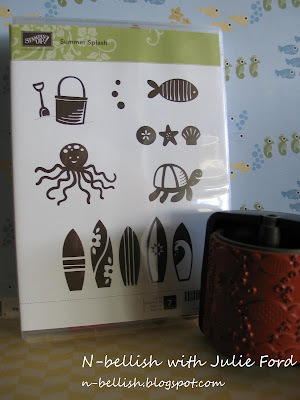 The canvas I got at Riot Craft Stores at our local mall and the rest is all Stampin' Up products. Cutting the paper squares took some time, as did attaching them all together then placing them onto the canvas. I used velcro dots to hold on the tins so that they can be removed each day allowing the count down to happen. The only thing that I did find somewhat frustrating is the fact that the tins are quite small so you can not fit much into them. I had ideas of being able to pop little Smurfs and the likes in them but there is now way they'd fit. I ended up having to fill them all with various sweets and tiny things like erasers and stickers. I'm missing a couple numbers at the moment as I didn't have any left overs in my chipboard set so have to wait until a new order arrives! Noah loves the calendar which is really all that matters and I am pleased it's something I have made that will hopefully be around for a long time. The new Summer Mini Catalogue has been launched today and it's full of new and exciting products. This mini catalgue in particular is jam-packed with all sorts of goodies, with images and greetings for just about every occasion throughout the entire year. Coordination is one of the things Stampin' Up! is known for, and the product suites epitomise this. The Spice Cake Suite is definitely my favourite this time around. The new Simply Adorned product line now gives you the opportunity to personalise bracelets and necklaces. 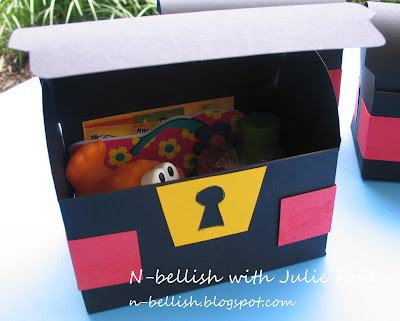 These would make wonderful teacher presents for the end of the year. 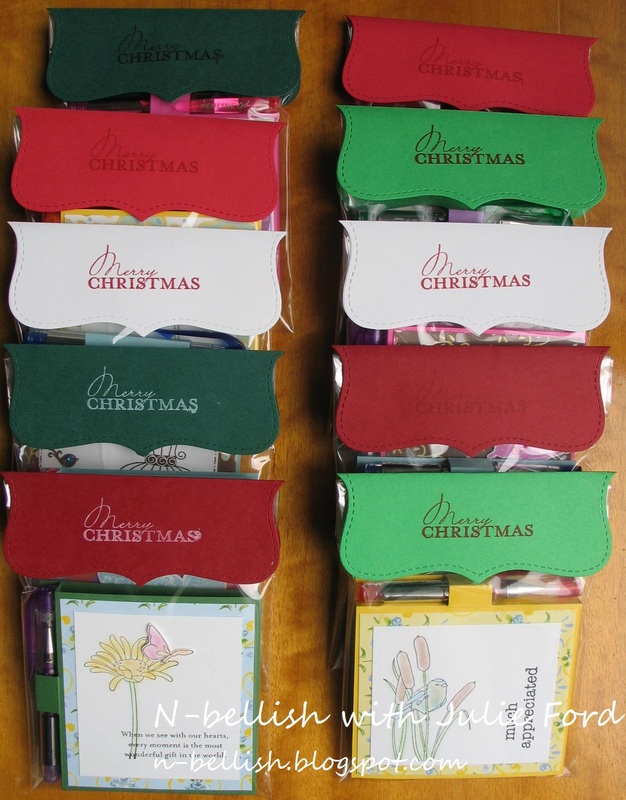 Christmas is covered with the Simply Stockings stamp set and coordinating Stocking Punch that can be used in conjunction with the amazing Glimmer Paper. 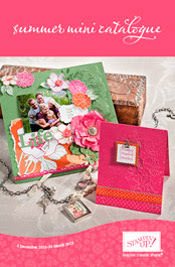 Don't forget there is also a limited release Hostess Benefit stamp set that can be purchased when you spend over $300. Ordering is easy, just send me an email and I can place your order within 24 hours and you'll have your goodies within 72! Is your family constantly asking you what you'd like for Christmas, the solution is here! Plus, who doesn't love a sale at Christmas time? 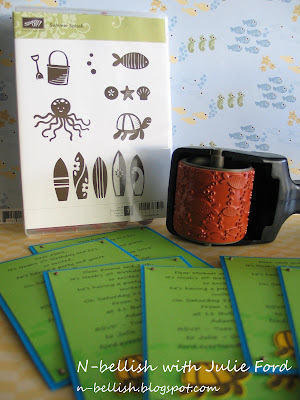 For the month of December get up to 50 percent off great Stampin' Up! products during the December Frenzy sale! So click on the link and head over to see what's on offer. These will go quickly so don't wait to order, email me so I can get your order in before they're all sold out.